Assessment. It brings up all sorts of ideas -quizzes, checklists, formal, informal, observation, anecdotal, and THE TEST to name a few. Assessment can be many things, but what I want to get at, is the true nature of assessment. If we just break it down and ask ourselves what assessment really is and why do we do it, it comes down to this - we assess to discover if a student has acquired the understanding of the concepts and information we have taught. Did they reach the learning goal? What do they understand and what do they misunderstand? Throughout many years of teaching and parenting, I have come across so many teachers who seem to have lost sight of the true nature of assessment. I have seen teachers do some awful things to kids in the name of "assessment". So, I have come up with a list of assessment dos and don'ts to get us thinking about how and why we assess kids. 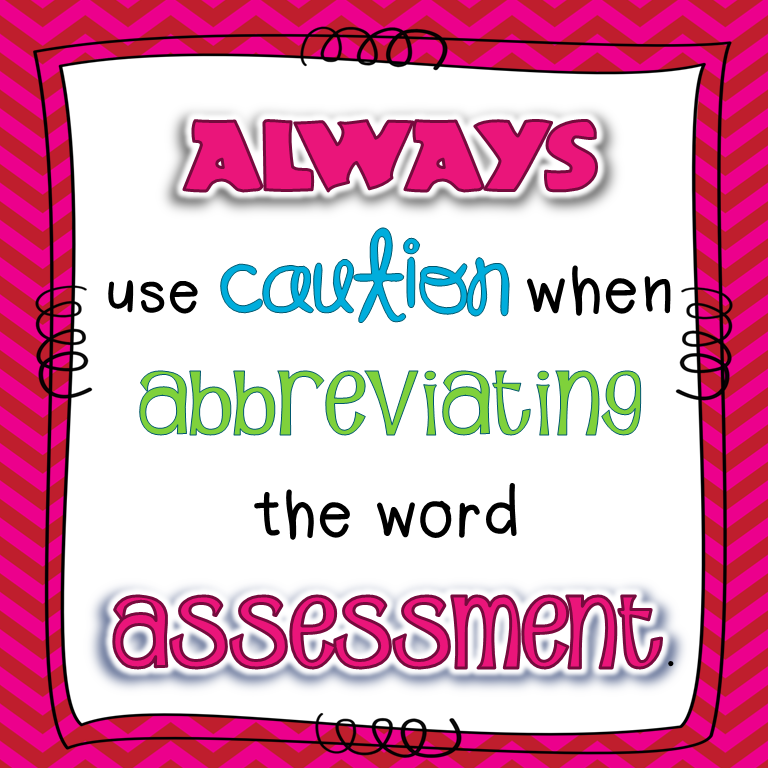 DO use the assessment to plan instruction. I've been in planning meetings where someone says. "I'm assessing tomorrow, but I haven't seen the test yet, does anybody have a copy?" *cringe* How in the world did you teach this whole week if you didn't even know what the assessment looked like? I know we use standards to plan instruction, but if you haven't either created your assessment, or at least looked at the required assessment before you teach, then you may not have taught what you are assessing. DO NOT use the assessment to trick students. Sadly, I have seen teachers try to trick students on the test in the name of 'paying attention' or 'problem solving.' I remind myself that I want to know what they understand and what they misunderstand, not fool them into getting a wrong answer. Yes, I want them to pay attention and discern relevant information, but let's just be fair about it. DO make sure your assessments are neat, clear, and correct. I have seen a few assessments come home with my own boys that are an embarrassment to the profession. My son's class would be instructed to make changes all through the test (change the 7 to a 9 on question 14, on question 6 that should read mode, not median, etc.) before they could even take the test! That is just a sign of a disorganized and unprofessional teacher. Now, I know (I hope) that is an extreme example, but we should strive to provide clear and accurate assessments so kids can concentrate on the task and not be confused by the corrections. DO NOT take off points for things you are not assessing. If I am assessing how well a student solves word problems, I will not take off points if he spelled a word wrong in the answer/explanation. I am not assessing spelling. I am assessing math. "But how will Billy learn to remember to put his name on his paper if I don't take off points when he forgets?" Well, I guess we have to think of something else, because remembering to put your name on your paper is not math. Maybe that brings down the work study grade, but not the math grade. If a student's grade becomes a B instead of an A because of organizational things like forgetting a name or date, or making a grammar mistake on a math test, then we have done a disservice to the anyone who views that grade as a marker of the student's knowledge base. DO use assessment to reflect on teaching. If 75% of my students bombed the assessment, then the kids didn't fail - I did. Time to rethink and reteach. Do reassess if you can. Remember, the whole reason for assessing is to ensure that our students understand what we're teaching. If we reteach, we should reassess. My goal is to get those kids learning, not to teach, assess, and move on. If you have more ideas and suggestions for fair and effective assessment, please leave a comment! You can just stay right up on that soapbox! :) I don't know why education companies feel like they have to do that - it makes our job harder! This is a very thoughtful and insightful post. I agree with your stance on assessment completely. What's especially disheartening to me is the way the education community as a whole has created a culture of competition in the eyes of parents and students. The entire school experience and the success of a school, teacher, student, and parent gets wrapped up in one score. It's a crying shame. We need more educators doing exactly what you just did...speaking truth and light into the world about what assessment truly is. Thank you!! Thank you! I do wish we could focus on more authentic assessment. Oh, by the way...I'm now following your blog and TPT store! Cuuuute stuff in your store!! LOVE this post! I have said so many of these things all the time. My son has been getting ready for our state testing, and the teacher keeps giving him lower grades on it because of things they have not learned, nor will they be tested on. It drives me bonkers! He knows what he needs to know but is graded on stuff he will not need until a couple of years down the road. I used to teach the grade he is in, so I know what is expected. OK...I feel better now! I think I need to send her this post!! I think it is more frustrating for us as teachers because we know what it can, and should, be. Great discussion. Assessments are such a hot topic right now. There is a movement to stop all Standardized Tests until the Common Core/Parq assessments roll out. I would hope so! Come visit my blog at Evil Math Wizard. I completely agree with all your wrote! I wish more teachers and principals had your attitude! I would also add that your classroom assessments can be differentiated for different learners, especially Spec. Ed and ELL! Great post! "DO use assessment to reflect on teaching. If 75% of my students bombed the assessment, then the kids didn't fail - I did. Time to rethink and reteach." Excellent reminder! I always tell my firsties that we can't look at each others papers during a test because I need to know exactly what they know. I don't want to know just about their neighbor! I tell them that is how I can help them be super students! And I tell my first graders the same thing! I love the tri-fold dividers we use for privacy. Great post! I'm a new follower of yours, too. I agree with the 75% statement. Many teachers just don't see that, but it's the truth. We're getting ready for the Writing SOL here now! Good luck with the writing SOL - my middle son will be taking that, too. I really enjoyed this post because as teachers, we really need to take a long hard look at how and why we are assessing our students. Are we simply doing it because we are required to or is there a higher reason? Do we use assessment to punish those who aren't paying attention, reward who are or as a key to the next level of education. Should our students pass a standard test to graduate? If so, should it be in math, literacy, science? Should we use oral exams or other forms of assessment in case our students simply aren't good at writing pencil and paper tests? In a perfect world we would provide our students with three or four options to choose from so that they are fully express their knowledge. The problem with that is time, any teacher will tell you that we simply don't have enough of it to create different assessment items to see to the diverse needs of our students. So what do we do? Great post! As a mother of 2 daughters with ADHD, 10th grade and 5th grade, it's so great to see there are teachers out there who truly care about the education aspect of teaching and not just showing up, following the plan and recording the grades. Each child learns a little differently and to make tests so tricky now, they have enough stuff they are stressing about. My kids will physically get sick stressing about the end of year testing and such because so much is brow beat to them from the first day of school. It should be about learning the material and not just remembering for the end of year test. Thank you all!